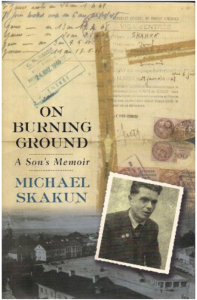 “On Burning Ground: A Son’s Memoir” (St. Martin’s Press) is a dramatic narrative of a young man’s radical reinvention of the self. Here you find a story of perhaps the supreme imposter, a “Catch Me If You Can” tale-meets-World-War-II. The Washington Post termed this interfaith psychological thriller of assumed identities, split personalities and hair-raising escapes that crowds several lives into one, “The Tale of a Holocaust Houdini.” It is at once a story of a young man as lone spy, artful dodger and ultimate chameleon. In effect, his journey to the end of night carries the reader from piety to perdition and back. A tale of the extinction, as well as recovery, of the self, it limns the contours of battle-tested faith – its loss, resumption and final exaltation, its ascension toward light.